There is a sense of excitement in the air, every time I am informed that an interview with Shahid Kapoor has been confirmed. The set up is always different, the conversation is fun and inspiring, but personally, the biggest takeaway are his philosophical one liners that stay with you and motivates you to be different. At a time when most actors create a bubble around them and only believe in showing off a candy coloured world, which is far from reality, Shahid believes in keeping it real and has a practical approach towards everything. Of course, you can expect that to come from someone as talented as Shahid, because in his remarkable journey of 12 years, we have seen him grow and change with every film. Just like a chameleon, Shahid adapts to new characters, settings and the world created by his director, with ease, like a true pro. He did that in Haider, where he completely surrendered the actor in him, to the vision of Vishal Bharadwaj and emerged as the dark Haider Meer. And now, he is all set to woo us with his sharp, suave and fun portrayal of Jagjinder Joginder in Shaandaar, which hits the screens next week. From the dark world of Haider Meer to the quirky duniya of Jagjinder Joginder, how did you manage the transition as an actor? My job as an actor is to adapt, shift to different worlds and sensibilities. If I achieve that, it will help me become versatile. So, I try to do that in every film, where I come from one world and step into a different one immediately. Sometimes it translates, but there are sometimes when it doesn't. In Haider, I was really fortunate that everything was translated well. 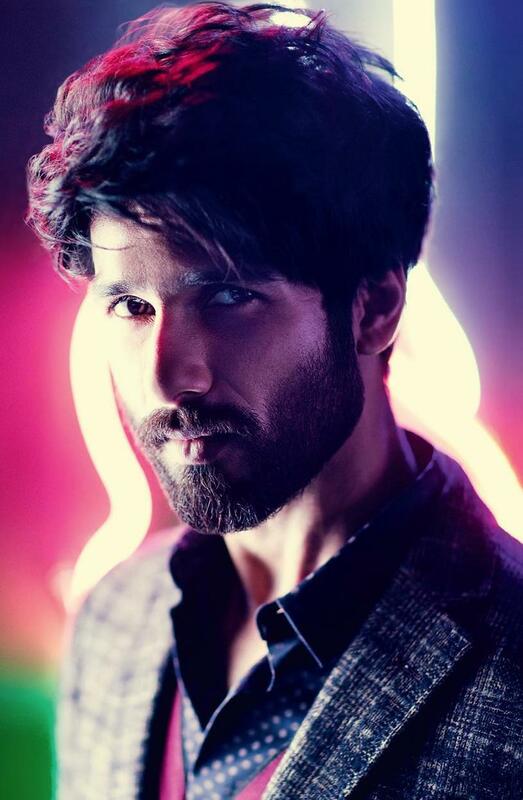 I think in Shaandaar, the fact that there is a major contrast between the look, character, genre and almost every important aspect helped us create a world which is very different from the one in Haider. And as an actor, I have always enjoyed such challenging transitions. Personally, I don't like transitions which demand me to go from one similar genre to another. It just gets too boring and I feel that I am getting too repetitive. Shaandaar was a welcome change, which I am very happy about. Also, I was moving out from the edgy world of Vishal Bharadwaj, to a completely different wacky one created by Vikas (Bahl), and both of them are fantastic film-makers. It's exciting to come out from a dark film and get into a more fun space, which is closer to what I have done in the past. Shaandaar is a quirky love story, and I guess the last film of a similar genre that I did was Jab We Met (2007). It's rare to do such films, because there is really not much left to do or say in this genre, unless the film-maker has a new point of view. So, what was it about Shaandaar that really got you hooked on and how did you come on board? I don't think I have still been signed by Vikas (laughs). But yes, I did meet Vikas when Queen was being shot. As for working with him, we all know that he is a national award winning director and his work, be it Chillar Party or Queen, has always been appreciated. So, no one can question his credentials. Also, I am not the kind of a person who will go the typical way while signing a film. I go by my vibe with an individual and the gut feeling about a subject. After watching Queen, which I saw 6 months before it released and that too, without the background score or other post-production edits. So, it was pretty much the first edit of the film. After watching the film, he told me that there is a new subject in his mind and later, he just said that there is a random one line which he would like to work on and that was the idea for this film. And, I genuinely liked it. But, Vikas believed that there shouldn't be any distraction at this point and said, "If I write it now and you say no after 3 months, asking me to write something new, then I will end up wasting six months of my life." But, I was very sure about this idea. After that, we didn't meet for months, and then one day, he just came up to me and said that the idea we had discussed has been worked upon, which was called Shaandaar. He wanted to discuss the script and I gave my nod immediately. Then he was keen on getting Alia on board, which also worked out. Everything else, like Haider (for me), Queen for Vikas and Highway for Alia, happened after that. Since the three of you tasted success with all the above mentioned films, do you think the expectations with Shaandaar are sky rocketing at the moment? Honestly, it doesn't really matter. What really matters is how the film has turned out. What I really like about Shaandaar is the fact that it didn't get made because Shahid, Alia Bhatt and Vikas Bahl, after their respective successful films, wanted to collaborate and do something together. Like I said, it came to us when none of us were hot and happening (smiles). It was our love for the idea that brought us together and we really wanted to work on it. And today, it feels amazing to see how the film is being talked about. I would much rather keep it this way than the other way. But, that's the part and parcel of an actor's life. Like after Haider, people kept asking me "Arey! Now, what will you do?" I can't keep thinking about such things seriously. See, I may keep getting films like Haider, and hopefully, even Shaandaar may do well, but then, there will also be times when I will get films which are not as memorable as them. It's a constant process of trial and error. But, what really matters is how passionate you are about your work. You should enjoy working with the people who are a part of the project. One must work in a process oriented manner, and not result oriented. This has been my biggest learning experience in the last couple of years. Nobody is aware about the end result, so you just relax and enjoy the process. I have been in this business for 12 years, and I have given a large part of my life to this. I started acting when I was 21 and my film released when I was 22. I am 34 today, so it's like doing this work for pretty much my entire adult life. I have given so much of my life to this job, so I better enjoy it. Jagjinder is an insomniac in the film, and so are you, in the real world. Was it easier to connect with your character in the film because of this trait? Oh yes! I am an insomniac and I usually sleep very late. But, things have changed and I have become better behaved ever since I got married (smiles). So, the insomnia is almost taken care of and the issue has been resolved. When I was a bachelor, I was more of an insomniac, because there was no pressure on me. Jab khana hain khaa lo, jab sona hain so jao. Those were the days (laughs). While observing Vikas on the sets, what was that one thing that striked you the most? Personally, I feel that the world created by him does not exist in real life. It is way too quirky, wacky and cool. But, that's what we all love about him. I honestly felt that Vikas is a director who has a new point of view for even the most basic plots or genres. Actually, if you analyse the story of Queen, it is quite depressing. A girl is ditched before her wedding and she goes all alone on her honeymoon. But the way Vikas presented the journey of the lead protagonist did it all. He had a very funny take on it. So, I realised that he has a different nazariya on everything, which is his biggest advantage. I am 34 today, so it's like doing this work (acting) for pretty much my entire adult life. I have given so much of my life to this job, so I better enjoy it. We saw glimpses of your fantastic dance moves in Shaam Shaandaar. But, why is it that we rarely get to see you dance on the big screen these days? I feel like I have forgotten how to dance. Earlier, I used to dance everyday in my life. Dancing is a lot like cycling or swimming. The more you do it, the better you get at it. But you know, there is something that I decided five years back. People would keep saying, Shahid is a really good dancer and can also act. But, I wanted people to say that Shahid is a really good actor. And I knew that till the time I don't allow my dancing to take a back seat, the actor in me won't get noticed. What used to happen was that in every film, people would want me to dance, regardless of the character's requirement. Then, people would even conceive characters, just so that I could dance. This constant need to project me in a certain light left me feeling frustrated. So, I actually had to push the dancer in me behind and find myself as an actor, because that's my primary job - to be able to act. The fact that I dance is an added advantage, but that's not the centre of what I do. So, in a way, I am very happy. But, I should get back to it soon. Do you miss days when you would get ample time to rehearse and perform new dance routines for long hours? I am complaining because it has been five years and now, I really miss dancing. Dance holds a very important place in my heart. Even when I am not doing anything, one of the things that I love doing is to just go online and watch videos of people dancing and some of these people are damn cool. My brother (Ishaan) and I are huge fans of Les Twins. I was the one who introduced him to Les Twins and now, he has become the third twin (laughs). He loves dressing up and dancing like them. But yeah, I do miss dancing and more than anything else, dance for the skill. Not just for effect. Eventually, what we do is display our skill. But, to practice, hone and improve on a routine is actually the process which is more enjoyable. You actually feel that you are gaining something as an artist. It's always fun to learn something new when you are passionate about it. After you become an actor, you hardly get the time to do all this. So, I miss practicing my dance. I know people come up and say, "Oh shut up! You are a good dancer, so stop saying all this." Log yeh sab bolte hain, but I know that I miss practising like a real dancer! People would keep saying, Shahid is a really good dancer and can also act. But, I wanted people to say that Shahid is a really good actor. And I knew that till the time I don't allow my dancing to take a back seat, the actor in me won't get noticed. You became one of the youngest celebrity judges on Indian television with Jhalak Dikhhla Jaa Reloaded. What made you take it up? I felt that I was ready for it. I knew that I have done films for 12 years, but I have never attempted television. Also, it's because I think I am ready to anything now. I don't enjoy being myself, as much as I enjoy doing a different character or trying something new. As far as JDJ Reloaded is concerned, I really enjoyed the show and interacting with contestants. But, my true passion is still attached to playing characters. When I watch Game of Thrones, I am blown away by the performances. So personally, if I am offered a really exciting character, I won't care about the medium, whether it is television, films or even online. Like, I loved my father in Karamchand, and that was aired on television. So as far as you perform well, the medium doesn't matter. What kind of shows do you personally like watching on television? I love watching a lot of these international series. Some of my favorites include Game of Thrones, House of Cards. I just started watching Empire, which I thought is pretty cool. I saw Boardwalk Empire sometime back, which was pretty interesting. Also Homeland, Tyrant among others. I usually get all these shows on my hard drive and whenever I get the time, I just watch it. The dancer in you must have enjoyed the process of being a judge on the show. Honestly, I hate being a judge. Personally, I would hate it if I was the one who was practising, sweating it out and somebody sitting in a suit with with gelled hair would say, "I don't think that was good." I would be like, Aaja beta pehle yeh karke dikha aur is routine par teen din bita (laughs). The experience was great, but being a judge and commenting on each routine, keeping in mind the hard work that goes behind it, was a tough task. I hate being a judge. Personally, I would hate it if I was the one who was practising, sweating it out and somebody sitting in a suit with with gelled hair would say, I don't think that was good. From the time you danced with SDIPA in 1995, to turning judge in Jhalak Dikhhla Jaa in 2015, how have you seen dance evolve? I think dancing is evolving a lot now. I feel that we will witness a lot of change in the next 3-4 years. Also, physical fitness has generally become very huge and people have become very aware about how they can be functional in their training, as opposed to just being big and pumped up. The teens today are far more evolved and aware as dancers, than what we were back then, and this is all thanks to the power of information. When we were teens, there was no information and we behaved like complete idiots. We didn't know anything! I remember how when I had joined the gym for the first time, there was a huge instructor, whose name was Lathi sir. Paaji was 6 feet 4 inches and his arms were the size of my thigh (laughs). I was a scrawny kid, and he used to make me lift the heaviest set of weights in the gym. He would simply go (in his punjabi accent), "Haaye laagao ek, haaye laagao do." I didn't know the technique and was only the doing the motion, while he would hold the entire weight. So, it's just an example of how that time, we didn't have enough information or awareness about a lot of things, like the proper technique, how to get fit, the right diet among other things. There was no exposure, because there was no internet. I think that kids these days are blessed with a lot of information. And in a way, that is both their advantage as well as disadvantage. The disadvantage being that having too much information without any experience or training can be harmful. So I think not just dancing, but all the forms of fitness will only keep getting better. Do you think an actor's chemistry with the director translates on screen and affects the way an actor portrays a character? For example, you have delivered two hits with Vishal Bharadwaj. Hopefully, we will be third time lucky (smiles). With regard to Vishal, I think I am lucky that he casts me, because he writes some really amazing films. I feel that a lot of times, what you see of an actor, is actually the role. Because as a viewer, the role is the actor. If the role has a lot of potential and the actor is able to do justice to it, it becomes a great performance. Vishal gives an actor the opportunity to shine. He is very particular and meticulous, but is very open minded about everything. And that is one of the nicest things about him. You can only be open minded when you are confident and experienced, because you need adapt and one can adapt to things only when you have the ability to improvise. And he has these two qualities which he uses beautifully and it does help me as an actor. Saif (Ali Khan) has earlier stated that he gave his career best performance with Vishal in Omkara, and he felt that your best act was in Haider. So, the audience must expect fireworks in Rangoon, because the team will take things a notch higher. What do you have to say about that? That is one strategy. My way to look at it would be, pata nahi yaar kya hone waala hain, hopefully stab theek thaak ho jayega. Toh expectation kam rakho (laughs). But on a serious note, it is going to be a lot of fun working with him (Saif) and I am looking forward to it. Every film has its own identity and set of positives, negatives. Personally, I don't think I can compare any film to Haider, because films are like babies. Like right now, Shaandaar is eight days away from delivery. Udta Punjab is in the fifth month, and Rangoon is to be conceived, while the last baby I had was Haider. A lot of planning goes behind each baby and it takes more than 9 months to make a film, from conception to release, quite literally. So, personally, I can't choose between any film. I don't think I can compare any film to Haider, because films are like babies. Like right now, Shaandaar is eight days away from delivery. Udta Punjab is in the fifth month, and Rangoon is to be conceived. Fan Question: You have worked with Supriya Kapur in Mausam and in this film, you are sharing screen space with your dad, Pankaj Kapur and sister, Sanah, for the first time. How was the experience? It is a big honour for me to work in the same frame as my Dad, because of the actor and performer that he is. I was very nervous around him. As for my sister, I am extremely proud of her. It was very difficult for me to believe that she has grown up, is an actor and that we are actually doing a film together. It was both an emotional and proud moment for me when I saw her giving the first shot. She had strictly warned us not to be around during her first shot and said, "I have enough pressure with Vikas sir directing me, now please, you guys go away." Since Dad is anyway in his own zone while shooting, he simply walked away. But, I stood behind the tent and kept looking secretly. I even took pictures of her giving the first shot, and I still have those pictures on my phone as fond memories. Did you help Sanah with any tips or advice before the shoot? I don't like to create a wish-list for myself. There is no fun in doing something that has already been done. I am someone who likes to roam around in spaces that are ambiguous. What about Ishaan and Ruhaan? Do they look up to you as a quasi-mentor? They never ask me for any advice. I mean, never have they pointed out anything. In fact, Ruhaan loves giving advice. Like, he has very long hair right now, which he loves tying in a bun. He will have this intense expression on his face and when we are sitting on the dining table eating food, he will go, "I need to explain to you guys, what is right and what is wrong." Both my brothers are scorpions. As for Ishaan, he loves to come and tell me how badly I am dancing these days. He keep saying, "Sit up and take notice. Pick it up." It's all because dancing has reached another level today, and his advice is more about dancing. Are there any other specific characters or genres that you want to explore soon? Not really. I don't like to create a wish-list for myself. There is no fun in doing something that has already been done. I am someone who likes to roam around in spaces that are ambiguous. It is very exciting to create something in ambiguity, than to have clarity about what you want to do even before attempting it. I like to have a role, not know how it will work out, work on it and then see if it becomes something. Do you think the requirements of an actor in Bollywood, be it the physique, looks or performance style, are changing with every decade? But who sets these requirements and parameters? I personally feel that nobody needs to be anything or follow a particular rule. You can be normal, and if you can hold the audience's attention when the camera rolls, you will find work for sure. When I watch House of Cards, I am glued on and mind blown by the lead protagonist's performance, who is nothing close to good looking. But, he is the most amazing thing I have seen moving in front of the camera and that's why I watch it for an hour. Like, I can watch it for eight hours in a week and still not get tired of it. It's good to look nice, get in shape and all that, but that's not the reason why you become an actor. Everything else is secondary. Focus on the cake, learn how to act. Other things are just like an icing. What would be your advice to actors, who are struggling to find their niche or are still trying to discover their potential? I personally feel that I am not someone who can give advice or be an example, because I am still struggling and trying to find myself. Also, I wish that everyone, including my siblings, don't go through the kind of struggle that I went through in the last 12 years. But over the years, what I have learned is that eventually, it is important to find yourself and do what truly makes you happy. That is exactly what I am doing right now and it has worked for me. It might stop working 2-3 years down the line, but at least where I am today, it's good for me now. I love doing what excites me. My search is not based on comparisons or what some other actor is doing. It is more about things that keep me satisfied. I am doing exactly the opposite of what you are generally told, like "dekh isne aisa kiya, toh tum bhi karo." Nobody had done a Haider, and very few would attempt something like that. If I was in an earlier phase of my life, even I wouldn't have thought of doing it. But then, I got maximum lover for Haider, only because I followed my heart and did not follow any logic. Today, I am constantly striving to find the actor within myself, accept challenges, do things differently and hopefully, keep at it. That's the only thing I can say. Beyond that, I am no authority to comment on what works and what doesn't. Because things are constantly changing. There is no right and wrong. So, what's next for your Shanatics to enjoy on the big screen? After Shaandaar, there is Udta Punjab, which is in post-production. We will start work on Rangoon very soon and I have also finished a day long shoot for AK vs SK. Exclusive contest for Shanatics coming soon (open to Indian and International residents)! Stay tuned for details.